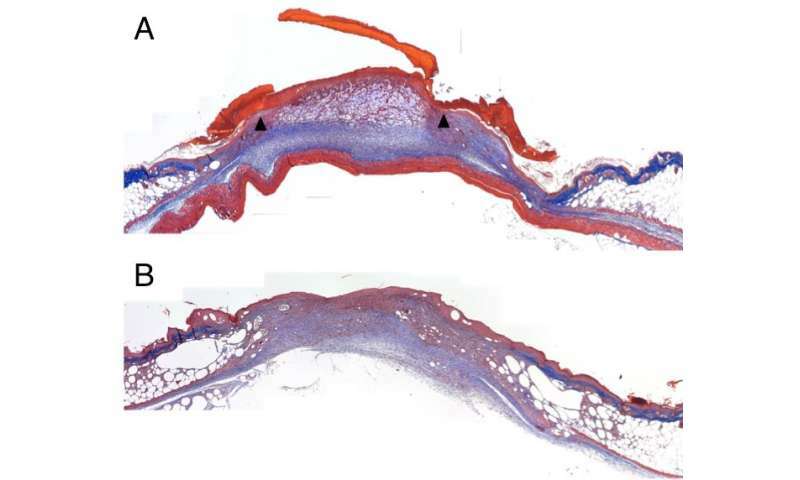 Wound healing is improved in diabetic mice lacking TSP2. These are magnified images of wounds 10 days after injury from (A) diabetic mice and (B) diabetic mice lacking TSP2. The sections are stained with Masson's Trichrome, which allows visualization of extracellular matrix (blue) and new epithelium (light pink) in the healing wound. The black arrows indicate the wound edges. The wound in the diabetic mouse remains open, while the wound in the diabetic mouse lacking TSP2 is closed. Credit: Britta Kunkemoeller, Yale University. One of the most frustrating and debilitating complications of diabetes is the development of wounds on the foot or lower leg. Once they form, they can persist for months, leading to painful and dangerous infections. New research uncovers the role of a particular protein in maintaining these wounds and suggests that reversing its effects could help aid wound healing in patients with diabetes. "We discovered that a specific protein, thrombospondin-2 (TSP2), is elevated in wounds of patients with diabetes as well as in animal models of diabetes," said Britta Kunkemoeller, a doctoral student at Yale University who conducted the study. "To determine whether TSP2 contributes to delayed wound healing, we genetically removed TSP2 from a mouse model of diabetes and observed improved wound healing. Our study shows that TSP2 could be a target for a specific therapy for diabetic wounds." Kunkemoeller will present the research at the American Society for Investigative Pathology annual meeting during the 2018 Experimental Biology meeting, held April 21-25 in San Diego. Diabetes currently afflicts nearly 26 million Americans, more than 8 percent of the population. Diabetic wounds are one of many complications of the disease. Treatment for these wounds is mostly limited to standard wound care, such as moist bandages, removal of damaged tissue and footwear that reduces pressure on the wound. Despite these measures, the wounds often persist. In the most severe cases, it becomes necessary to amputate the affected foot or lower leg; diabetic wounds are the leading cause of amputations in the United States. Most previous work on wound healing in diabetes has focused on the types of cells that are involved in wound healing such as immune cells, skin cells and the cells that form blood vessels. By contrast, Kunkemoeller's research focuses on TSP2, a component of the extracellular matrix. The extracellular matrix is a meshwork that serves as the structural foundation for cells, like the scaffolding used in construction. In addition to providing structural support, the extracellular matrix regulates processes that are important to wound healing, including the behavior of immune, skin and vessel-forming cells. TSP2 is a component of the extracellular matrix that influences how the matrix is formed, as well as the development and communication of other types of cells that grow within the matrix. The team bred mice that develop type 2 diabetes but cannot produce TSP2. When the researchers induced wounds in these mice, they found that the mice without TSP2 healed significantly better and faster than other mice that had diabetes along with normal levels of TSP2. They also analyzed the factors that influence how much TSP2 the body produces. That part of the study revealed that TSP2 production increases when blood sugar levels are higher, explaining why people with diabetes have higher levels of TSP2 than people without diabetes. "Currently, our lab is developing engineered biomaterials derived from extracellular matrix that lacks TSP2," said Kunkemoeller. "Our plan is to apply such materials to diabetic wounds in mouse models in order to evaluate their efficacy. Going forward, additional research will focus on either preventing the production or inhibiting the function of TSP2 in diabetic wounds." Britta Kunkemoeller will present this research on Saturday, April 21.